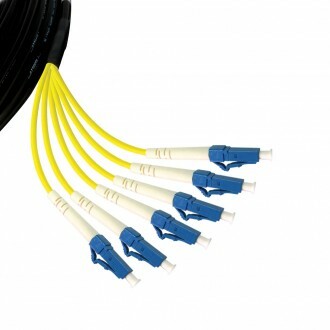 Use this Fibre Optic Cable for any of the DigiSender Modules available in this range. 6 x Cores - (Each 2mm) Enables up to 6 separate fibre modules to be operated over the one cable reel. For permanent or temporary deployment applications. All DigiSender fibre cables use a plasticised glass fibre core which is immune to breakage under normal flexing. This core is 0.01mm in diameter but so tough that a bend radius needs to be created of typical 1mm before permanent damage is caused to the fibre core. To prevent this we encase our entire fibre cable series in a protective braid known as 'polyamide fibres' which when woven are commonly known as Kevlar. This prevents the cable from being bent at such sever angles. The kelar braid is bonded to the fibre core using a compound composed of thermoplastic compounds that emit limited smoke and no halogen. Kevlar is a class of strong heat-resistant synthetic fibre materials commonly used in aerospace and military applications. It is so incredibly tough that it is often used for ballistic-rated body armour and ballistic composites. It is also used as an asbestos substitute because it has extremely high flame immunity. They are fibres in which the chain molecules are highly oriented along the fibre axis, so the strength of the chemical bond can be exploited when force is required to pull the cable through ducting. This alone creates an incredibly tough protection and makes it extremely difficult to accidentally break the internal plasticised glass fibre core. In fact, it requires the use of tools such as pliers or hammers to break the core and cannot generally be broken by human pulling forces between your hands. It also means that pulling forces typically of 20N can be applied during installation of this cable. This cable type is sold under separate categories within the DigiSender Fibre range for permanent installations.. This cable also features metal armouring for high reliability and hostile applications. It means that all the features explained above are significantly enhanced and this then provides suitability for hostile and frequent use applications. The metal armouring is a steel close-coiled tube added during the production process to bond all elements of the cable into one strong robust and virtually indestructible cable. Finally, this cable has an outer jacket composed of thermoplastic compounds that emit limited smoke and no halogen when exposed to high sources of heat or even flame. The final bonding process locks in the strength that this cable provides.